Neal Barnard, an adjunct associate professor in the medical school, published a book on the dangers of cheese last month and performs in a rock band when he isn't researching. At an album release party last month, Alec Baldwin, the famous actor who now plays Donald Trump on “Saturday Night Live,” said it best – Neal Barnard is Eddie Van Halen with a medical degree. By day, Barnard is an adjunct associate professor in the School of Medicine and Health Sciences, runs a nonprofit organization and writes books about nutrition, including his latest, “The Cheese Trap.” As for the Van Halen tendencies, Barnard leads a 16-member band that released their third album in December. A professor in GW’s medical school, a book about cheese, an album release and a Hollywood actor may seem like an unlikely combination, but Barnard, an adjunct associate professor of medicine, says he doesn’t want to limit himself to one profession. I always have wanted to break boundaries, whether it’s in medicine or in music or in literature. 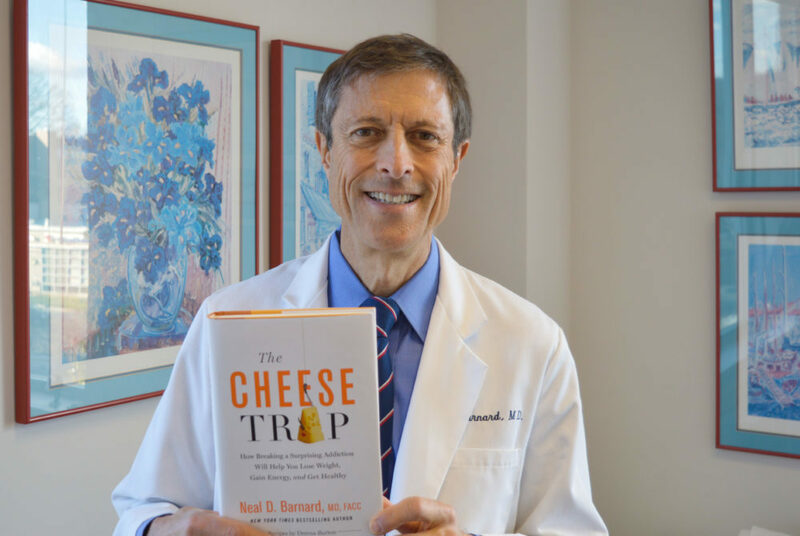 This week, Barnard published his 18th book, “The Cheese Trap,” which explains how people become addicted to cheese and how cheese affects the human body. The book is already on the list of top 20 weight loss books on Amazon. Barnard said the idea for the book sparked more than 10 years ago when he was doing an experiment on how diet affected Diabetes patients. He said the experimental group of patients in the study was held to a strict vegan diet and even after cutting out ice cream, steak and other longed-for “cheat” foods, the patients in the group seemed to only have one overwhelming craving – for cheese. Barnard spent more than a year writing and doing research on cheesemaking that took him to Cheddar, England; Camembert, France and back to the U.S. to states known for their dairy production, like Wisconsin and Indiana. In addition to informing readers about how cheese is made and the biochemical effects the substance has on the human body, the book dabbles in the ethical issues surrounding the conditions at dairy farms. Barnard, who is a proud vegan, said that his main goal in writing this exposé on cheese was to show people that health is a “two-way street,” and that medical conditions, like diabetes and heart disease, can be reversed by eliminating cheese. To help people make lifestyle changes, Barnard enlisted Dreena Burton, the author of best-selling vegan cookbooks, to develop recipes using cheese replacements. Some of her recipes are included throughout his book. When he isn’t informing the public about the benefits of a vegan diet, Barnard leads the rock band he founded after graduating medical school, CarbonWorks. The group is now 16-members strong and plays “genre-bending” music that is difficult to piece together but ultimately works, Barnard said. Much of my mission as a doctor is not to just treat one patient at a time, but to get messages out to large groups of people. The band’s latest album is self-titled and is the first of the group’s that is available on iTunes. The songs may seem disjointed, because one minute you’re listening to an Italian singer and the next track is in English, but the changing nature and unique instrument pairings keep listeners engaged. The group is studio-focused because the members range from an Italian singer to a musician who plays the classical Vietnamese dan tranh, which means they often can’t get together for live performances. Barnard said that throughout his careers in two opposite fields, he has learned that people respond to different “languages.” In order to reach people and change their outlooks on certain topics, one must be aware of the language they respond to, he said.